Did you enjoy going to circuses and enjoy the animal and their taming show? It was always awe-inspiring to see the tamers take good control and the wild animals so well-trained. But a recent circus show held in Ukraine left the audiences shocked and screaming. It so happened, that while the show was on, the lion attacked the trainer and pinned him to the ground. 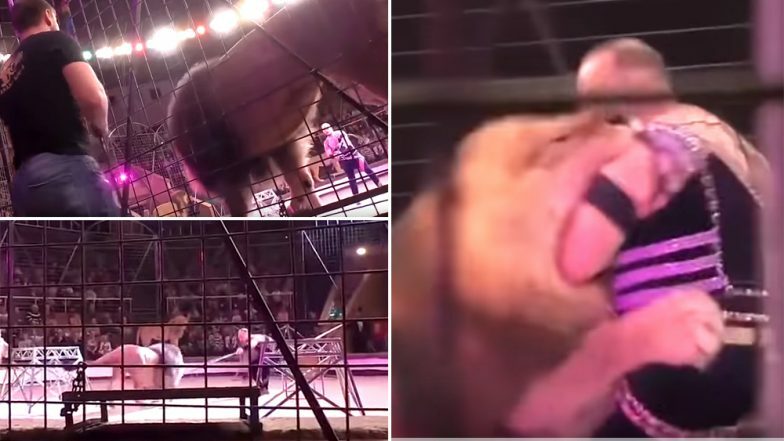 Video from the circus was shared online and is going viral. The audiences were terrified to see the wild cat go out of control and get aggressive, but thankfully the trainer was saved in time with minor injuries. Pet Lion Kills Czech Man, Police Shoot Wild Cats in Victim's Garden To Reach His Body. The shocking incident took place at the Lugansk State Circus when trainer Hamada Kouta, the trainer was showing tricks with lions. Just as he called up another lion on the floor, the second one attacked him and pinned him to the ground. But Mr Kouta was able to regain the upper hand and got the situation in control. He sustained minor injuries. The audience was left in shock and the dramatic footage was caught on video. Lion Attacks Man in This Shocking Viral Video Shot at Marakele Predator Park in South Africa! The video is indeed terrifying. But talking about the attack the trainer told Metro UK, "The lion jumped at me and bit me - but thank God, not on my neck. He immediately let me go. My back, arm and leg were hurt. The most important thing for me is to see children in the audience. Of course, I was covered in blood, but I asked everybody to calm down, and started the performance all over again, from the beginning." He said the animals attacked him because they were unsettled after arriving at a new destination. This incident has once again brought up the issue of banning wild cats to be made a part of the circus and such shows. It was fortunate that the trainer was able to get the lions under control but in such case, the issue could result in something untoward.